Shocking footage shows the impact of one of three wildfires ravaging California, which have prompted thousands to evacuate. The video shows devastation caused by a wind-driven brush fire in the Ventura County area of southern California, which local fire services said had quickly spread across 4,000 acres. 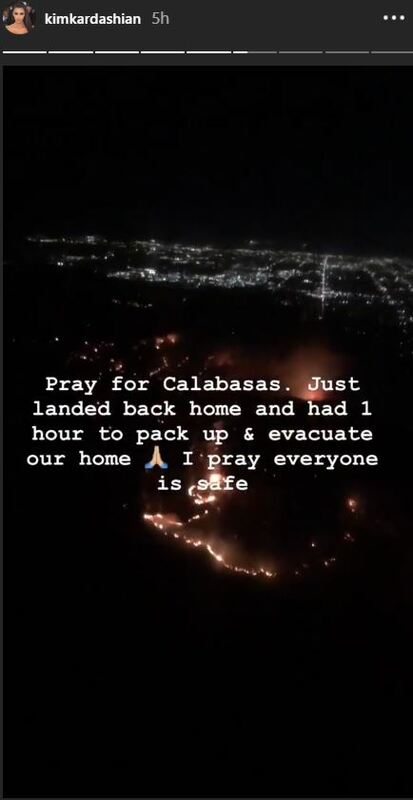 Reality TV star Kim Kardashian West was among the many forced to flee, posting on Instagram a video of the flames from a plane window. She said: “Pray for Calabasas. Just landed back home and had one hour to pack up and evacuate our home. An Instagram photo by Amanda Peixoto-Elkins shows the dangerous levels the fire has reached. The fire in Ventura County broke out on the afternoon of November 8, with thousands of residents quickly ordered to evacuate. More than 160 firefighters have been dispatched to the area and eight air tankers have been ordered. A second southern California wildfire is also burning just north-west of the San Fernando Valley section of Los Angeles. And in northern California, thousands have fled a fire that has destroyed homes near the town of Paradise in Butte County. The wildfire is burning just a few miles from the site of the mass shooting that took place in the city of Thousand Oaks on November 8.